Yarny is an adorable little red man who can make bridges out of his own guts. He trails guts everywhere he goes, and will die if he doesn't constantly pick up new guts from the environment. If he runs out of guts, that is the end for Yarny. In fact, by pressing right, you're constantly killing the poor little man. Stop killing Yarny you monsters. In this video our saccharin friend uses buoyancy and bridges to overcome life's struggles, represented here by a few basic physics puzzles. Not shown: the moment in the live run during the EA Gamescom conference when Yarny drowned in front of a live audience. I love the highly detailed miniature environments. It's a charming style that's been put to great use before in games like Little Big Planet and Pikmin. 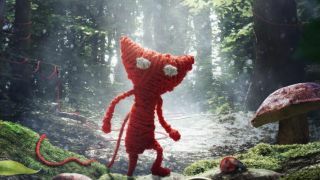 Unravel is due out early next year. Have a tissue box ready.